Chances are if you're on this website, you might also have trouble finding foods that you can eat safely while traveling. My first thought about going on a 15 day road trip across America was "hell yes! "....my second thought "what the hell am I going to eat?". But with some creativity and clever maneuvering I managed to make it just fine, even better in fact as I wasn't ever stuck and having to resort to grab something that could turn my experience on the road SOUTH (no pun intended ;) and bonus, it kept the trip very affordable too! Foods that are triggers (flare up autoimmune response) for me include, dairy, gluten, sugar, eggs, soy and corn so when I travel I prefer to stick to the Autoimmune Paleo Protocol to be completely safe. This keeps my immune system and energy levels in check. I was really excited when my friend Lauren (who's a vegan) agreed to go with me, and so a vegan and a paleo go road tripping through the Wild Wild West... HA! We knew this was going to be an adventure. We were leaving from Los Angeles, CA and headed to Altlana, GA where we would part ways and I would move on the east coast as she flew back to LA. Our itinerary included stops in Sedona, The Grand Canyon & Page - Arizona, Monument Valley - Utah, Albuquerque, Sante Fe & White Sands - New Mexico, Marfa & Austin - Texas, New Orleans - Louisiana and last Atlanta - Georgia. We arranged to stay with friends and in Airbnb's along the way - this way we would always have access to a kitchen. I was also happy to see in nearly every place we were going there would be a Whole Foods- which meant a salad bar would always be an option. We had planned to leave at 8am on Monday morning, this meant I needed to pack plus meal prep the night before. I wanted to have my breakfast plus travel food prepared (at least lunch, dinner and breakfast the next day for the first stop in Sedona). We took a cooler and froze several water bottles over night to use as ice (thanks pinterest!). In addition I spiralized zucchini "zoodles" with a spirializer and flash cooked them in a pan with avocado oil - cooked just enough until they're slightly soft. You know what a road trip calls for - snacks! I placed an order days before of some essential snack items from Amazon to keep my blood sugar and tastebuds happy! Plain Pea Protein powder, my stomach bloats with most protein powders and I've found this one to not bother me at all! It's very simply the one ingredient - pea protein and it tastes great, a little nutty light flavor. MacroGreens Superfood - I added about 20 servings into a bag for easy access on the road. I like this one because it's does not contain nightshades like other powders tend to do. Bulletproof XCT oil - I love this oil because it stabilizes bloodsugar and fuels the brain! I also had superfood energy boosting, anti-inflammatory mushroom powders, Reishi and Chaga. With those three things I could make a shake at any time. 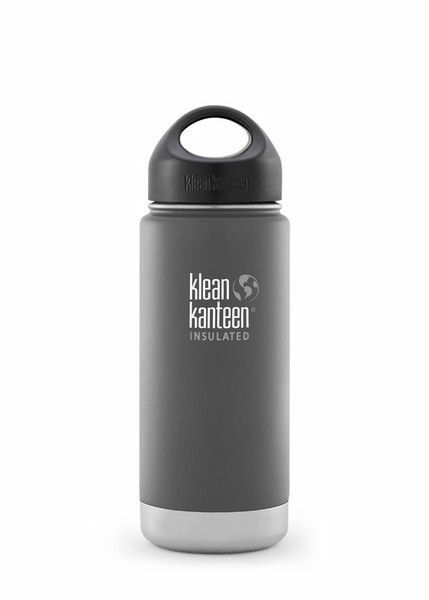 I used my "Klean Kanteen" just add all ingredients with water and shake! 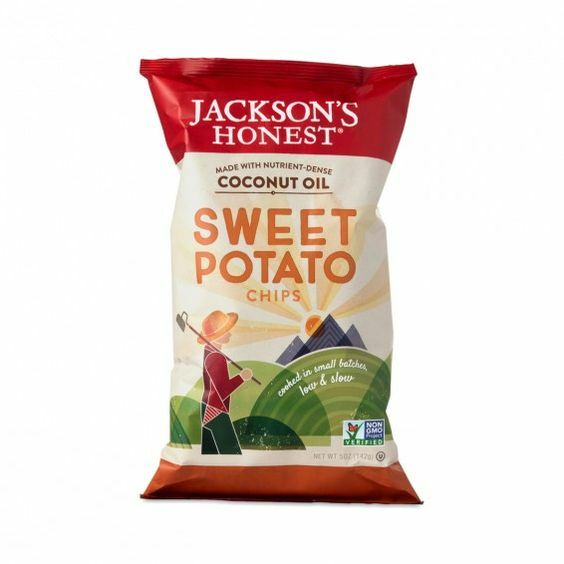 I'm obsessed with Jackson's Honest sweet potato chips made with coconut oil they hit the sweet, salty and crunchy satisfaction! The Amazi plantain chips I found on amazon and wanted to try them because they were made with coconut oil and cinnamon, baked not fried and I could get a bulk size for less. These took a little getting used to - they weren't what I had expected them to taste like but they grew on me and I ended up really liking having them on hand. Epic Bars - Bison, bacon, cranberry, is the only AIP version, and I personally like this one the best! Seaweed - Wakame (quick soak in water for 10 minutes and it's ready to eat. 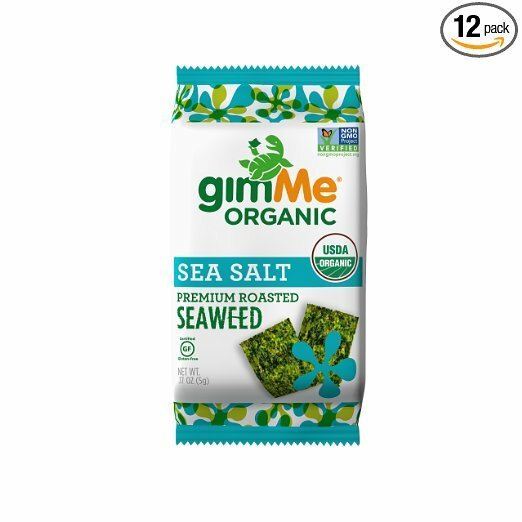 As well as GimMe Seaweed snacks made in olive oil (take an avocado, slice and wrap it in a seaweed sheet! YUM) You can even find ready made seaweed salad packs just soak in water and you've got salad! Pacific Bone Broth single servings - Either drink as is or use for soup, heat the broth in a small pot, add wakame and cook until soft to make a healthy seaweed soup! You can find my Road Trip essentials amazon list here! We arrived in the evening and luckily I had enough food from my prep for dinner, and breakfast the next morning. We spent the day hiking and sightseeing around Sedona. I was excited to find there was a Paleo restaurant in the area but we happened to be there on the one day of the week they were closed - BUMMER (I'll save it for next time)! Our next choice was a gluten free, vegetarian place called The Chocolate Tree. We arrived at what seemed to be a small cafe from the outside and were asked if we would like to sit out on the patio. We walked down a long hallway to the back where it opened up into a beautiful courtyard, filled with trees, hammocks, wind chimes and yoga music playing in the background. I ordered The Green Goddess salad and boy was it ever so green and so very goddess like! Covered with Dulse (a sea vegetable) and sprouts. Hold the seeds please ;) With a golden latte on the side, I requested it be made with coconut creme instead of almond milk - YUM. In the evening we went to stock up at whole foods for what would be the next few days (where we knew healthy meals would be a challenge). I bought a box of organic frozen turkey burgers (no other ingredients), chard, siete grain free tacos shells, olive oil, avocados, sweet potatoes, romaine lettuce, and carrots. next stop, the grand canyon! By the time we arrived at The Grand Canyon we were starving and headed straight to the Canyon General Store for lunch. I pulled out my bag and began to unload my things....and I realize it's missing... all the food I bought is missing...I go back to the car, not there either. It dawns on me that I didn't double check the fridge in Sedona when we packed up- I had verbally confirmed with Lauren that it was all packed up (I don't know- it was early??!!) lesson learned...always double check the fridge! 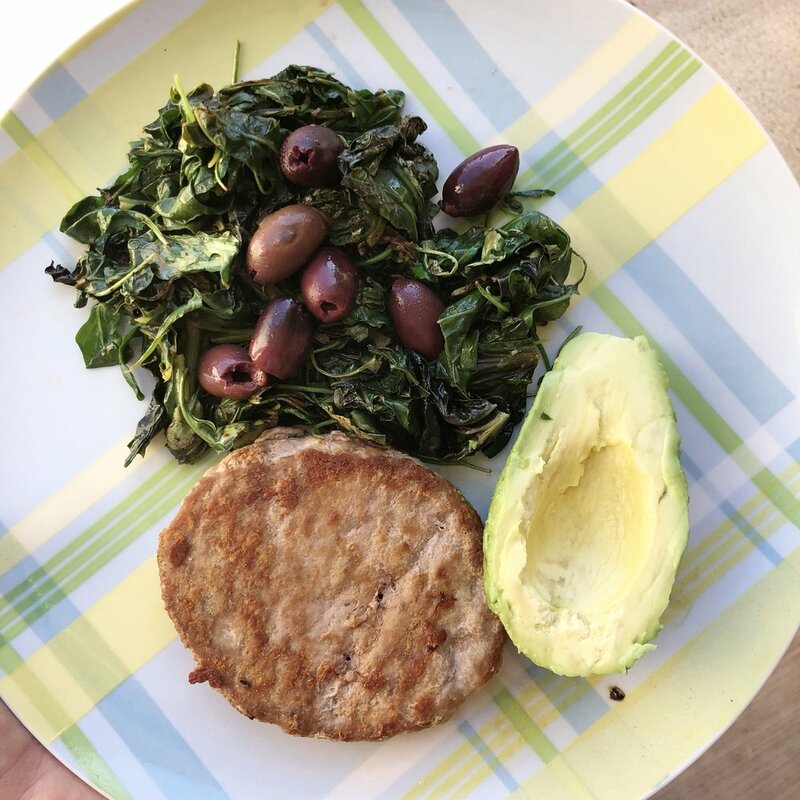 Time for some resourcefulness I thought ok- I have a cooked turkey burger, sweet potato and olive oil - I just need some lettuce and I can make it work! To my pleasant surprise- the general store delivered! They had several "Organic Girl" lettuce options, organic green beans (which I snagged for later) and I was excited to see they had Epic and other organic Jerky brands and Kombucha! Located in Page are two beautiful destinations, Horseshoe Bend and Antelope Canyon. We arrived in Page to our Airbnb at night (cue the bone broth and seaweed soup!) The next morning we went sightseeing and then off to the local "Wally World" aka Walmart! Not the best organic section but they had enough. I grabbed some avocados and romaine. I sautéed the rest of the arugula and combined with my frozen turkey burgers for lunch and dinner. The last photo on the right was my meal prep for our driving day from Page to New Mexico, salad and green beans (the ones I picked up from the general store) and left over sweet potatoes. 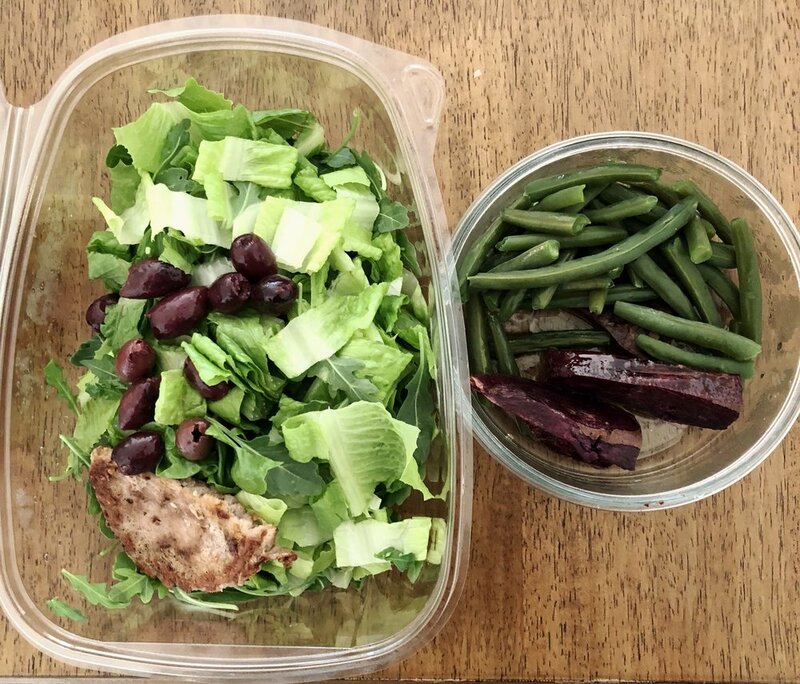 I like to reuse salad containers for traveling with salad (these are great when flying because you can throw them away when finished) & always recycle if possible. Luckily in Albuquerque we stayed with friends so it was very easy to eat normally and cook however we wanted. 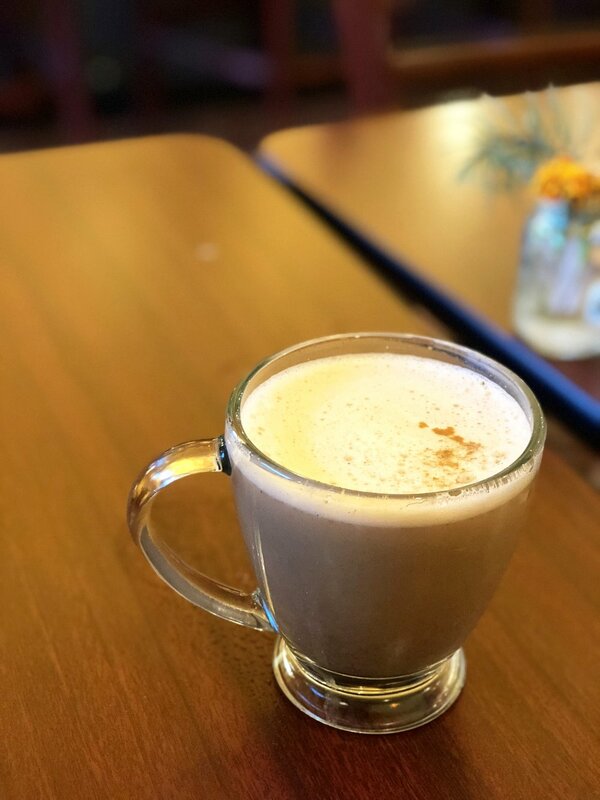 We spent the day in Sante Fe and found a really lovely gluten free, vegetarian cafe called "Love Yourself Cafe" how cute is that! I ordered the coconut milk mushroom soup, it was creamy and warming and delicious almost like a curry with rice on the side. 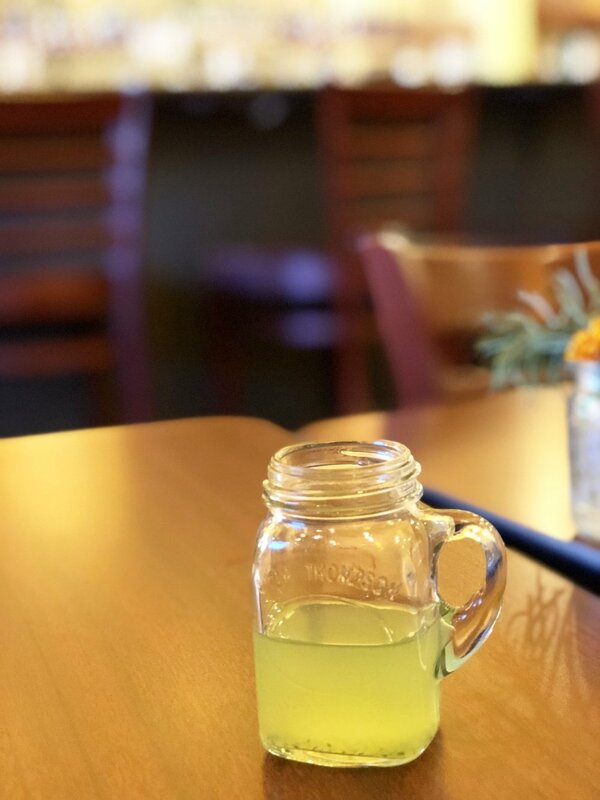 By this time in the trip my energy was really lagging and I needed all the help I could get so I ordered the "adrenal elixir tea" it had adaptogenic herbs and mct oil. They also brought out complementary "love water" containing coconut water, apple, cucumber and cell food. What a treat! Glamping was in order for the night. In a super fancy tent with heated beds El Cosmico in Marfa, TX is possibly the coolest place I've ever stayed. After driving ALL day we were happy to snuggle into our warm bed and may or may not have made a few delirious Instagram Stories that night. By the time we arrived it was too late to use the communal kitchen and luckily had leftover salad bar from WF earlier and Lauren had her vegan sushi. The next day we found an amazing Mediterranean food truck called "Food Shark" where we had brunch on our way out of town. By the time we got there it was packed (must be the most popular place in town!) they told us it would be about a 45 minute wait. We ordered our food (I got the Lamb Shish Kababs - modified on a salad in stead of pita). And as luck would have it there was a Gemstone store next door (aka my happy place) where we could spend time while we waited! All in all the food was delish and I collected about 5 new crystals. We spent the day playing in Austin and grabbed lunch at Picnik Austin, this incredible Paleo restaurant that serves MCT and butter coffee if you're into that sort of thing! For me it was all about the special diet menu. Specifically designed for Whole 30 and AIP, denoting nightshade, egg and nut free options. 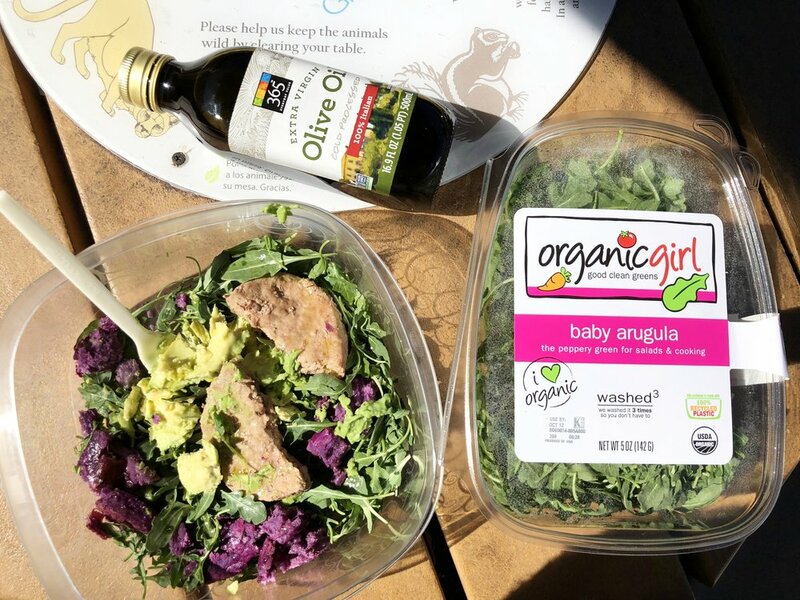 They take so much care in responsibly sourcing their produce and meats from local organic grass-fed farms. I ordered the crispy chicken (baked chicken thighs with skin!) And then I ordered the grain free taco's to go for the car ride later. OMG YUM. Seriously though YUM. I fell in love with this place, it's got everything an autoimmune warrior could ask for! I wasn't holding my breath for many healthy options in the south - but again to my surprise right in the middle of the French Quarter was "The Green Goddess". Which sounded promising! This cute cafe is nestled in a long ally way with outdoor seating, where you can here all the jazz bands in the distance as you dine. They were really accommodating to my needs and were able to make me a deconstructed sandwich (pork belly with shrimp, hold the sauce, cheese tomato and bread). For a city that's known for it's wild partying and overflowing booze down Bourbon Street surprisingly there are healthy options, while strolling around we stopped in Petite Amelie and I ordered a ginger, beet, carrot juice! P.S. the Whole Foods in New Orleans is killing it, this place was beautiful! And look at the meals I was able to prep - dinner that night and breakfast the next morning. We stayed in a hotel with access to only a mini fridge and I wasn't about to attempt the continental breakfast LOL. Although, if had any complaints about Whole Foods in general it would be about their practice of cooking everything in Canola Oil, this stuff is as inflammatory as it gets - I tried to stick to the salad bar as much as I could with little cooked here and there, but none the less they are still the best option for avoiding the trigger foods. Where else but Whole Foods of course, I really didn't mean for this blog to be about whole foods but we nearly hit every single one possible across the southern stretch of the USA! But alas here we are....and now you know where they are! I bonded with the guy that worked behind the juice bar because he and I decided we were hair twins - short, naturally gray and we both always get the same question "is your hair real?" He served us up some wheat grass shots (much needed after a night out in NOLA ;). Did you know that swishing wheatgrass in your mouth for 30 seconds before swallowing, activates saliva and prepares your stomach for full absorption and making it surprisingly sweet - how cool is that! Lauren however, was clearly not feelin' it. The guy behind the counter was also shooting me confused looks with squinting eyes and concerning eyebrows, I thought he got me, he was my hair soul mate!? Oh well - anything in the name of health I say! Yelp & google are your best friend- when searching for a restaurant that's likely to have good options I use the key words - paleo, organic, healthy, gluten free or farm to table. One of these will usually do the trick. I suggest always calling ahead to ask if they have a gluten free menu or are able to modify meals. Reusable containers for storing food, cooking oils (if I did it again I would take my own glass baking dish), snacks, don't forget those enzymes to aid in digestion for when you do eat out, energy supporting herbs and supplements (Xct, Chaga, Reishi, Vit C, Adrenal support), quick protein sources (powder, bars) and magnesium (I like calm) is always helpful for sleeping, staying regular and an achy body from travel. Tea options, I like to bring ginger and mint (to soothe stomach), Tulsi (adaptogenic) and Milk Thistle (for liver support). And if you're flying don't be afraid to cook in advance and bring it with you, also pack some veggies in your suitcase if you want! And most importantly don't forget your sense of wonder! I hope this blog helped/inspired you to get out there explore and don't be afraid of not being able to take care of your body while on the adventure. Balance is so incredibly important, what heals your heart is bound to help heal your body. While this blog is strictly about food and what I ate, be on the look out for the travel version - more about the places we saw and the things we did!